1. 2-inch color display with graphical UI, easy for operation. 2. Audio-Visual indications for acceptance& rejection of fingerprints. 3. TCP/IP or RS485 communication for various networking environments. 4. Built- in auxiliary input with enhanced flexibility to link with wired detector or switch. 5. Up to 15 multi-verification methods to enhance security level. 6. 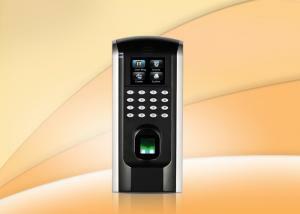 Standard access control features such as Time Zone, Holiday, A&C Group , Unlock combination etc. 8. Duress Alarm offers effective protection against duress by threats. 9. Optional metal protection case for outdoor installation. 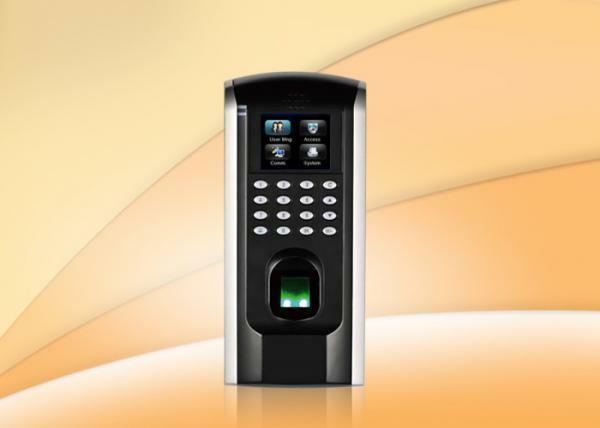 The F03 is an IP based fingerprint terminal that works in standalone and network modes. The 4*4 keypad and LCD display make it easy to operate in standalone mode. In network mode, it can connect with Access3.5 software for access control and time attendance management. Wiegand output enables the F03 to connect with any third party control panel control that supports 26 bit wiegand, which a llows security suppliers and system integrators to integrate Teco fingerprint identification technology that is accurate, convenient and cost-effective with their current system. Auxiliary input interface allows F03 to connect with an external source, for instance a smoke detector or emergency switch. Once the linkage function is enabled through the machine menu, the device would generate an alarm signal and open the door in case of emergency. Granding Technology is a global Biometrics & RFID products and service provider by a top China-based team. With combined core of Biometric technology and great integrated ability behind us, Granding believe that our company is not just about creating the perfect final product for the client, but it is also about being part of the client’s team. It is not "what can we do for you". It is "what can we do for us". Granding has assembled a team of specialized R&D, quickly responded sales, wisdom of planner and efficient logistics, offer newly technology products to customers home and abroad. With the development in relevant business field, Granding have gained customers all over the world. They are able to distribute our products better supported by our excellent service and specialized knowledge. High quality, reasonable price and prompt service have enabled us to create more business opportunities to our customers and bring more benefit and flexibility to end users. Your security, my profession, as a way of thinking that guides us and pushes us forward. We see things from a global perspective, always striving to create and produce products of the highest quality at a reasonable price for worldwide customer satisfaction. We see a bright future fueled by new technology generation, believe we can bring more pleasant surprise to everybody. Our vision is to be one of China’s leader in safe & security field and offering undisputable service and quality. Our position is to be part of the customer’s team, the customer is a part of ours. As the name implies, Grand is our primary core value. We believe trust is the foundation of building the right relationships between customers and us. At Granding, we know that taking care of your business is our business. we are aiming at establishing a grand business by delivering what we promised and growing together with you. There is no sense in delivering a product on time, without excellent quality. A job not done well, is a job not done. Granding promise that all our products, from design, materials, producing, testing to packing are under well control, and every working procedures with process marks can be tracked at any time. Throughout the process, we also are transparent in our progress updates and amending to any defect with respect. Granding adhere to continual creativity and improvement. Even the best companies have room for improvement. Companies that do not change cannot meet the needs of a changeful business environment.